Nvidia's Titan RTX costs as much as SLI RTX 2080 Ti. On Saturday, some early 'leaks' hinted that Titan RTX would be announced soon. While it's not on sale yet, the official Titan RTX product page is now live at Nvidia. If you thought the RTX 20-series prices were off-putting, the Titan RTX is going to be a bitter pill. But Titan cards have never been about value. Specs are much as expected. Titan RTX gets the full TU102 treatment. That's 4,608 CUDA cores, 72 RT cores, and 576 Tensor cores. It also gets the full 384-bit memory interface, and in a bit of a surprise it doubles the memory capacity to 24GB. The base clock is 1350MHz, with a boost clock of 1770MHz. In effect, it's a lot like a Quadro RTX 6000, but without the Quadro drivers and with the GDDR6 clocked at the full 14 GT/s, and a slightly higher boost clock. 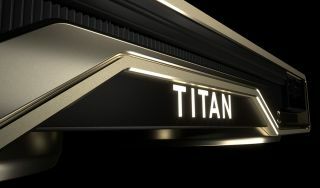 Titan RTX also marks a return of SLI (NVLink) support to the Titan line, after it was missing in the Titan V. Like the 2080 Ti, it uses the full 100GB/s NVLink connection if you pair up a couple of Titan RTX cards. And there's a gold NVLink connector to match the Titan RTX gold color scheme. Not surprisingly, the price is high. Nvidia effectively doubles down on the RTX 2080 Ti pricing, with the Titan RTX selling for $2,499. It will start shipping later this month, and as with previous Titan cards, it will only be available direct from Nvidia or from one of Nvidia's SI partners. For the same price, you could buy two RTX 2080 Ti cards plus the NVLink connector, and still have $20 left for lunch. In terms of performance, based on raw specs, the Titan RTX has 6 percent more CUDA cores, RT cores, and Tensor cores than the RTX 2080 Ti. That's the biggest advantage a Titan card has ever held over the same generation Ti model. Even more interesting, while the base clock is the same 1350MHz for the Titan and 2080 Ti, the boost clock is 8 percent higher than the 2080 Ti FE, and 15 percent higher than the reference 2080 Ti clocks. The TDP is also 280W vs. 250W/260W on the 2080 Ti cards. In theory that's up to a 21 percent performance advantage. And you still get twice the GDDR6. By comparison, the original Titan was up to 16 percent faster than the GTX 780, while the Titan Black was only 4 percent faster than the 780 Ti. Likewise, the Maxwell Titan X was only about 3 percent faster than a GTX 980 Ti, and the Titan Xp was also around 3 percent higher. Regardless of the larger than normal performance bump for a Titan card, Nvidia generally doesn't push Titan cards as gaming-focused solutions. The diminishing returns going from the top consumer cards to the Titan options have always been poor, and the cards are more of a status symbol than something we would recommend buying. Buy hey, at least it's $500 cheaper than the Titan V.